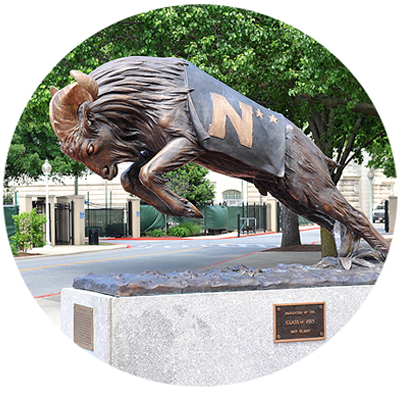 You and your family are encouraged to take a guided walking tour of the Academy with professional, certified Naval Academy guides through the Armel-Leftwich Visitor Center. Proceeds from the sale of Visitor Center tours and tax-free merchandise at the Naval Academy Gift Shop benefit the Brigade of Midshipmen. Anyone with a locally prepared USNA ID Card or a DOD credential, including military retirees and dependents may drive onto USNA. All others will need to park outside the Academy and walk in through Gate 1. All visitors 21 years of age or older must have a valid picture ID (see the list of Acceptable Forms of ID). Visitors under the age of 21 who do not have a valid picture ID must be escorted by an adult with a valid form of identification. Please check the current security restrictions before planning a visit. Please note that as a result of the REAL ID Act, some state/territory IDs are not sufficient for access to the Academy. Please check the Current Status of States/Territories to see if your state or territory's ID is compliant with the REAL ID Act. Drivers' licenses and state IDs from states that aren't compliant must be accompanied by an acceptable second form of ID (SSN Card, Certified Copy of a Birth Certificate, U.S. Citizen ID Card, etc.). Please refer to the list of acceptable forms of ID. For visitors without a locally prepared USNA ID Card or a DOD credential, all day parking is available in the Noah Hillman Parking Garage (accessible from Duke of Gloucester or Main streets), at the Navy-Marine Corps Memorial Stadium (directions), or at two-hour parking meters around the City Dock. See this summary of parking options in downtown Annapolis for additional parking locations. The Noah Hillman Parking Garage is the closest public garage. The entrance on Duke of Gloucester St. is on the left, just past Conduit St. Once parked in the garage, look for the stairs in the northeast corner of the garage. At the bottom of the stairs, walk straight down Gorman St. to Main St. The Annapolis City Dock is just a block down the hill on Main St. There is closer parking on Dock St, just on the other side of the City Dock, but it is metered with 2-hour maximum limit. 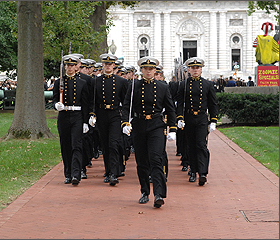 USNA Admissions presentations are held Monday through Saturday at 10am and 2pm, except federal holidays. Please visit the Admissions site for more information. 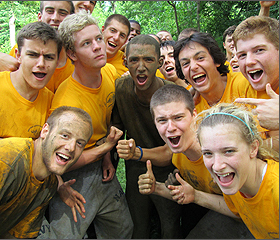 The United States Naval Academy Summer Seminar offers the opportunity for rising high school seniors to visit the Naval Academy for one week during the summer. Naval Support Activity (NSA) Annapolis is located across the Severn River from the US Naval Academy and is charged with delivering base operation support services to tenant commands. These include the United States Naval Academy and North Severn complex. 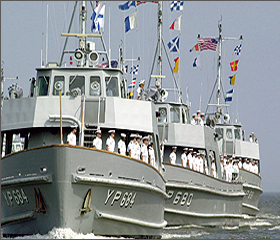 Find a list with information for Military Personnel and their families in our Naval Support Activity page. Annapolis, the capital of Maryland, is considered the "Sailing Capital of the World." Located 33 miles east of Washington, DC and 30 miles southeast of Baltimore, Annapolis has much to offer. Click on the links below for more information about Annapolis. 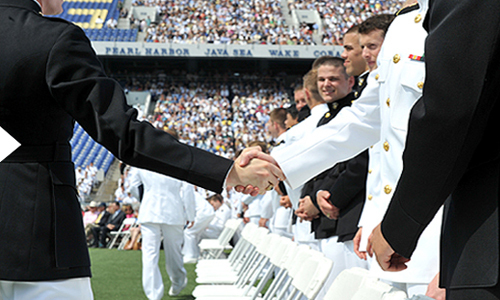 Commissioning Week honors the First Class midshipmen upon completion of four years at the Naval Academy. Parents, family members and guests are invited to attend a series of events at the Naval Academy in honor of the graduates including the Blue Angels Flight Demonstration, Color Parade, special awards ceremonies, and musical performances. Plebe Parents' Weekend is designed to offer parents, family members, and guests an opportunity to visit with their Midshipman and experience a taste of the traditions, academics, and atmosphere unique to the Naval Academy prior to the start of the Fall Term.